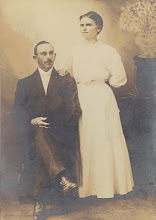 As I wrote in a post here, I am in the mood to spring clean and address some of the organizational issues within my family tree. 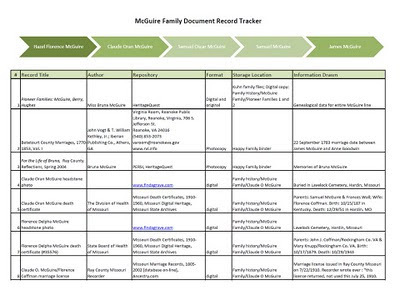 One issue I wanted to fix was the tracking of documents I have for each family. I have both digital and hard copy source documents that I have no way of tracking. 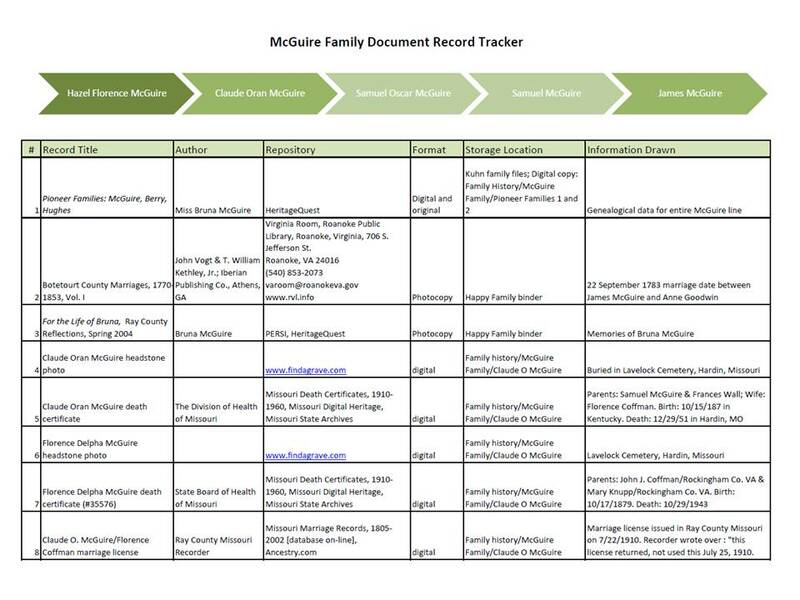 Each time I wanted to review my progress on an ancestor I had to pull out that family's three-ring binder and flip through the hard copy documents, then open the family's file folder on the computer and browse what I had digitally. So I decided to design a tracking document that would help me to iron some of it out. I created this spreadsheet in Excel 2007. Because I sometimes forget the sequence of ancestors, I inserted a graphic at the top showing the order of ancestors in this particular line using the Smart Art function. It provides many different graphic options; I chose the Basic Chevron Process graphic. For the headers I list the title or object, author and publisher, repository, format, where I have it stored, and the information (summary) I gleaned from the object. I'm not sure that I am totally in love with the document yet, but at least I'm moving forward. I might add a column indicating how I came across the document, like whether I found it at a library, from a cousin, or had it in my personal collection. How do you track your documents? What suggestions do you have to make this more functional? Interesting spreadsheet - I think you will want to add the source of your document - oftentimes you will find that there is more information to glean from a document later and perhaps the photocopy will not be enough. Also it will make life easier when you make use of the document in your research and you want to source it. Thanks for sharing. I concur. I put the respository, but I think the actual source would be useful to add as well. Thanks for your input! I have to do this and this is a great model. Thanks for posting this. Heather, what a fantastic idea!! I'll have to see how I can incorporate this with my "system" (or lack thereof) I have now! Thanks!! This is an excellent idea, Heather. I number each of my sources and use an Access database to keep a List of Sources Searched. I just wrote a blog about my determination to get organized at Searchin' for Kinfolk. Should have labeled it Sorting Saturday, but I'm new and still learning about this blogging business. Thank you for sharing. This is an excellent example to follow! At the very least, your spreadsheet is a great start. Please tell me more about HOW you use it: template on your desktop? online &/or printed out? etc. I've tried something similar before a couple of times, but I haven't found a structure or procedure that is easy enough or intuitive enough for me to keep it up... Thanks! As far as actually using the document: I update it every time I get a new piece of evidence or document. When I decide to work on this particular line of the family, I open the document and reference it to ensure I'm not tracking down the same paths that I have done before. Having this document keeps me from rummaging through my binders or computer folders looking for what evidence I already have.